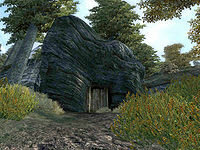 The Beast's Maw is a medium-sized cave between Bruma and Cheydinhal containing monsters. 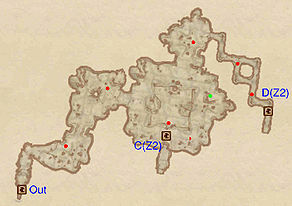 It contains two zones: The Beast's Maw and The Beast's Maw Caverns. This cave contains 23 Cairn Bolete plants. 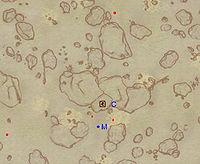 This location's map marker (M on map) is named The Beast's Maw (editor name TheBeastsMawMapMarker). The entrance door is N of the marker, 40 feet away. Despite an interesting name, this dungeon is fairly unoriginal and is home to more nuisance creatures than to monsters. The first two rooms in the first zone are mostly empty except for two enemies. The next area is an intersection containing up to two enemies and the only chest in this zone. From here, you can decide where to go; choosing to go through door C will lead you into a canyon in the second zone that contains only a couple of nuisance animals. 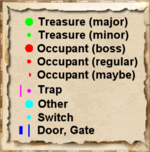 Navigating the hallways northwest of the intersection and taking door D will go to the upper area of the zone, which contains the last two chests in this dungeon. Therefore, taking door D is recommended. Depending on how you entered this section of the dungeon, you'll either be at the bottom of the canyon in this zone or on the area above it. If you took door D and are on the upper area of this section of the cave, you'll find two chests located on the southern rim of the canyon. Those who took door C only end up in the canyon, where only nuisance animals can be found. This page was last modified on 19 November 2018, at 04:14.